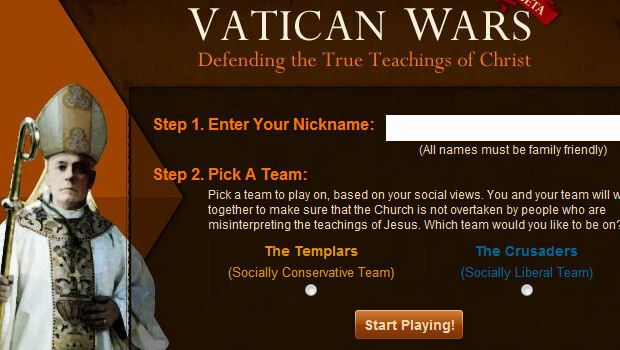 Vatican Wars, the hot new game for Catholic Facebookers! Do you spend more time on Facebook than at Mass? 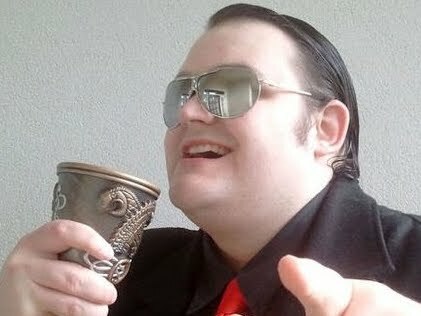 Well, you dirty little boy, why not combine your idleness and the word of Christ with Vatican Wars -- a hot new social game in which you can become Pope! The game allows you to join either the socially conservative Templars or the socially liberal Crusaders. You'll need choose sides in various issues, such as abortion, gay marriage, and whether or not you can slap a bunch of rubber on the end of your squirming little maggot (not their words). You can choose to "debate" players, perform duties, and invest in assets to increase your daily income. Perhaps the best part of the game is that I selected my beliefs as favoring gay marriage and abortion -- pretty much anything I could select that contradicted the Church's explicitly stated stances -- yet I keep winning debates against those Facebook users who don't favor them. Perhaps the Church is secretly more liberal than we thought! In any case, this is my new favorite game of the forever. I'll leave the inevitable jokes about minigames involving choirboys to you guys.